Spaghetti squash. It’s the one you always heard about and wondered why it was called that. Growing up, I didn’t like any squashes. My mom overcooked them, they were slimy and gross. Years later when I did the Ultimate Reset, I learned the art of appreciating the greatness of vegetables as they are, and cooking them simply and delicately to retain their natural textures and flavors. 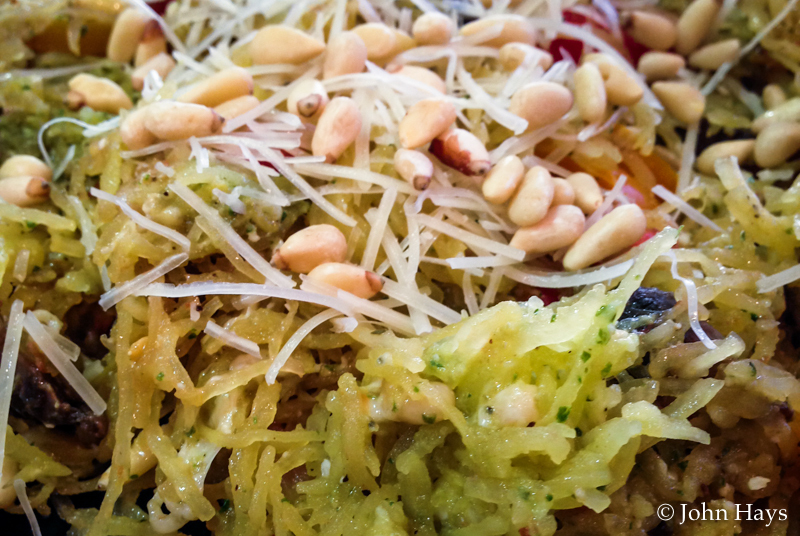 When a friend introduced me to this spaghetti squash recipe, I kicked myself for never trying it before, since spaghetti is my absolute favorite meal. Plus, I had never really tried pesto, so that was a welcome addition as well. I hope you enjoy this recipe as much as I do, and share it with your friends who love pasta. Healthy tasty alternative to pasta! Use food processor to process avocado, jalapeno, garlic, lime juice, cilantro and sea salt and handful of pine nuts into pesto.